With Christmas coming thick and fast, these campaigns give you the ideas you need. With the holiday season fast approaching, it’s time to start thinking about promoting your products and services to a host of gift-hungry festive shoppers. Festive spending in the US is on the rise again and by developing, as well as delivering, a creative, inspiring seasonal marketing campaign, you stand to increase your profits while growing your audience, significantly. The right mix of creative and strategic elements will ensure your marketing campaign cuts through the noise, speaks to your prospects on a personal level and earns you the seasonal success that you deserve. To help inspire your efforts, we’re going to explore three amazing examples of viral marketing, putting the power of well-timed, well-placed and highly-targeted miniature campaigns into living, breathing perspective. But before we delve any deeper, let’s consider the power and potential of this seemingly dark artform. The phrase viral marketing isn’t something to take lightly. In fact, becoming a viral marketing sensation is a real challenge. But, a timely campaign delivered with flow, structure and a dynamic mix of creative elements has the potential to get under the skin of a huge online audience of potential customers. If your campaign does ‘go viral’, you’ll be able to promote your brand, business or organization in ways that no other digital marketing model or medium can replicate. Essentially, when a viral campaign gains momentum, it’s almost as if magic comes into play, and this is what makes viral marketing such a powerful promotional artform. Viral marketing is a powerful force, and with 80% of online businesses currently using viral tactics to promote their brand as well as enhance their promotional campaigns, it might be time to enter the arena and join the competition. The average American consumer mentions specific brand names 60 times a week during both online and offline conversations. By tapping into the emotions of an engaged audience and showcasing your value, you could find yourself being mentioned across the World Wide Web, which will ultimately result in increased brand awareness and a boost to your bottom line. These three feats of viral marketing genius will give you the inspiration you need for your next marketing campaign. A campaign aimed at raising funds for Amyotrophic Lateral Sclerosis (ALS) – a devastating degenerative motor neurone disease that affects around 5,600 people per year – this amazing feat of viral marketing began with the single nomination of something called an ‘Ice Bucket Challenge’, which subsequently snowballed to epic proportions. The ‘challenge and nominate’ idea that formed the foundations of this epic viral marketing campaign is the primary driver of its success. Due to its accessibility, simplicity, mass appeal, organic celebrity endorsement, a strong element of humor and a memorable hashtag – #icebucketchallenge – this campaign gained viral status in a matter of weeks. As a result of this incredible feat, the ALS ice bucket challenge raised a total of $220 million (€178 million) for ALS-affiliated organizations, earned a notable 100 billion YouTube views and prompted a total of 28 million Facebook engagements in a single summer. The colossal success of the ALS Ice Bucket Challenge shows that by offering people a fun, simple challenge with an incentive to share the experience with friends, family and peers through popular social platforms, your campaign has the potential to spread like wildfire. In this notable feat of emotive marketing, internationally-renowned beauty brand Dove drilled down into their brand message of promoting inner beauty and encouraging self-affirmation with a visually captivating, creative video-centric campaign. This simple yet effective short film featured an FBI-trained forensic sketch artist drawing various women first based on their self-perception and then based on that of a complete stranger. During each sketch, the stranger’s descriptions were far more stereotypically attractive and akin to what the subjects truly looked like – locking in the brand’s message that women can be overly critical of their appearances and as a result, fail to see their true beauty. Despite a certain level of criticism, the campaign captured the hearts of both men and women from all walks of life, resulting in millions of views in more than 110 countries and becoming one of the most watched viral videos of all time. The campaign’s emotionally-driven message, coupled with its unique concept, tasteful production and sheer shareability, earned viral status in a relatively short space of time. And with a savvy, content-based distribution campaign, articles based on the video published on the likes of the Huffington Post, Mashable and other targeted digital publications, the campaign benefited from a healthy number of social media shares. Here the message is simple: inspirational video content plus a positive emotionally-driven message equals engagement. To promote the release of its first movie featuring Marvel’s most sassy and subversive comic book character to date, Deadpool, the brand put its best creative minds together to build a multichannel marketing campaign that picked up serious momentum in a matter of weeks. 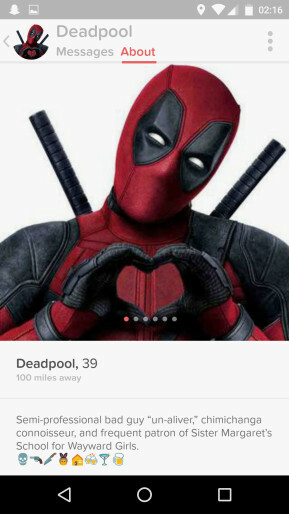 Based on the concept of Deadpool on Tinder, Marvel’s marketing team created a fake Tinder profile and used this stunning piece of visual mastery as a social media sharing tool. To keep the viral pace going, the brand also created a humorous series of YouTube shorts featuring the anti-hero and even developed custom Deadpool emojis for fans to utilize when sharing relevant content. As a result of this ultra-creative multichannel marketing campaign, the film became a roaring box office success, grossing its $132,434,639 in its opening weekend, earning countless social media engagements in the process. While Marvel may have a colossal marketing budget, the takeaway here is that by using your creativity as a promotional weapon, building a marketing campaign based on a stand out concept and creating content across a multitude of channels, from YouTube to Facebook, blogs and beyond, you stand to gain real traction in your niche – which could well result a healthy seasonal return on investment. A unique concept, idea or hook that has a wide-ranging appeal. A strategic approach that is centered around one medium but uses a wealth of consumer-facing platforms such as Twitter or Facebook to deliver a strong campaign message. A tone of voice and imagery that has a strong sense of brand identity and is driven by empathy, self-reflection or humor. A hashtag or visual asset (image, graphic or video) created for shareability. By exploring these three inspirational examples of marketing in greater detail you’ll see that all of the above elements are present in these campaigns – and by taking note of these innovative approaches, you’ll be able to make your next campaign (and all of your future market efforts) a roaring commercial success. We wish you the best of luck with your next marketing drive. For more insights that will steer you to success, you should read our definitive guide on how not to to promote your brand, including real-life examples that will keep you away from any potential marketing-based calamities.